GUTHRIE – The 19-, 20- and 21-year-old missionaries came dressed in uniform Wednesday: dark suits, white shirts, ties. 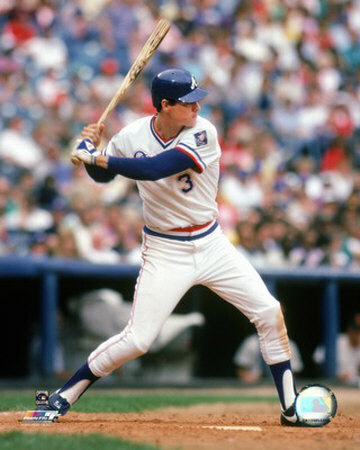 Dale Murphy, the 6-foot-5, 225-pound guest of honor, wore his uniform, too. Not the one he sported during an all-star baseball career in which he slugged 398 home runs, drove in 1,266 runs and won back-to-back National League Most Valuable Player awards in 1982 and 1983. In 18 major league seasons, Murphy used a bat to make his point. These days, the former Atlanta Brave relies on a King James Bible and a Book of Mormon. “I know that the Savior walks with you,” Murphy, 45, told about 75 missionaries at the Church of Jesus Christ of Latter-day Saints in Guthrie. Murphy and his wife, Nancy, just finished a three-year assignment overseeing 600 Mormon missionaries in the Boston area. Despite a hectic schedule, they found time to enjoy a few Red Sox games at Fenway Park. The Murphys, who have eight children ages 7 to 20, live in Alpine, Utah. Their two-day trip to Oklahoma this week served two purposes: to motivate the missionaries and encourage the Oklahoma mission president, Jim Engebretsen, and his wife, Tammy. The Engebretsens, from Pennsylvania, became close friends with the Murphys after the Braves traded the five-time Gold Glove outfielder to the Philadelphia Phillies in 1990. Money and fame never motivated Murphy, Engebretsen said. That’s not to say that Murphy did not enjoy the riches of baseball. In 1987, he signed a three-year, $6 million contract that made him one of the five highest-paid players in the game. Of course, that’s a piddly amount compared to shortstop Alex Rodriguez. But Murphy doesn’t begrudge Rodriguez. As a kid growing up in South Florida, Rodriguez worshipped Murphy, the best player on his favorite team. In his final season, 1993, Murphy batted .143 with no home runs and seven RBIs for the Colorado Rockies. He retired just two home runs short of 400. When he left, it was time to go, he said. In 2001 Baseball Hall of Fame balloting, Murphy fell way shy of the 75 percent support needed for election. He received votes from 93 of the 515 writers (18 percent) who cast ballots. He’s realistic about his future chances. “It’s very hard to get into the Hall of Fame, which it should be. And if I get in someday, I’ll be very grateful. But I know where I stand. I mean, if I had 3,000 hits and 500 home runs, I would be in,” said Murphy, a career .265 batter who finished with 2,111 hits. But Murphy, who became a Mormon at age 19 in his second year in the minor leagues, said he doesn’t worry about earthly matters such as the Hall of Fame. “Baseball and sports and those things are a lot of fun. But it really doesn’t provide any lasting happiness,” said Murphy, whose oldest son, Chad, 20, is in his second year of missionary service in Japan.